If you’ve read Jon Krakauer’s riveting, deeply disturbing Into Thin Air (on the disastrous 1996 Everest expedition), then chances are your mountaineering goals aim no higher than that fancy piece of overpriced exercise equipment generically called “The Step.” Still, the truth of the matter is that if some of the relatively out of shape civilian tag-alongs on that ill-fated ascent had followed the six-month preparatory program outlined in Doug and Courtenay Schurman’s Train to Climb Mt. Rainier, it’s possible that more people would have come off the mountain alive. The Schurmans, who run the Seattle-based Body Results, which provides personal training programs for outdoors sports strength and conditioning, here outline a half-year program that combines five training components: aerobic, flexibility, strength, anaerobic, climbing specific adjustments, and rest and recovery. Viewers will learn which aerobic, stretch and strength-building exercises are useful to prepare for climbing a high peak such as Mt. Rainier (14,411 ft.) and chart their progress with clearly defined goals (i.e. if you can’t carry a 30 lb. Backpack while maintaining a 3.5 mph speed on a treadmill set at the highest incline for a good hour, you aren’t ready to go). A list of additional resources include important books and videos, as well as instructions for downloading the training plan off the Body Results website. Since almost none of the information is Mt. 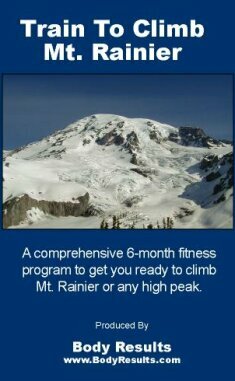 Rainier specific, this will be widely applicable to folks in all kinds of places who feel the desire to, as the noted Alpine conqueror Julie Andrews out it, “climb every mountain.” Recommended. Video Librarian Magazine is the video review magazine for public, school, academic, and special libraries within the United States. Order your copy now from the store!